It’s not just what the data says, but when it says it. 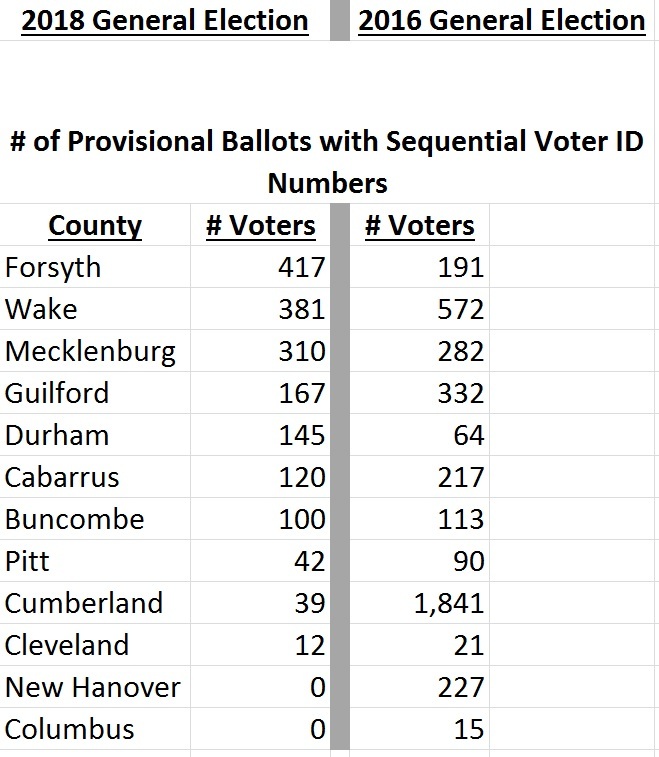 I imagine no candidate who ran for election in November of 2018 had any clue on Election Night when races were being called and conceded that over 33,000 Provisional Ballots had been cast that no one above the Precinct level even knew existed. The vast majority of them were cast on Election Day. 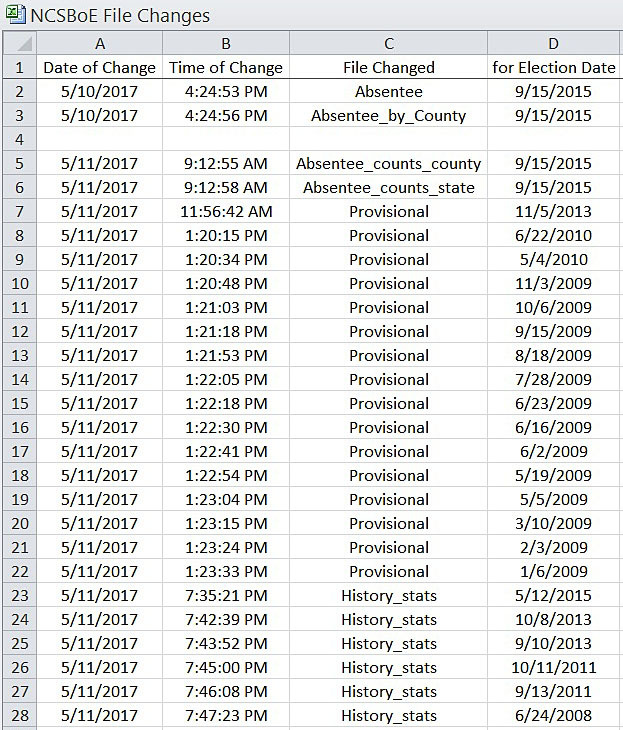 If you had downloaded the Provisional Ballot file from the State Board of Elections on the morning of Nov. 7, the day after Election Day, you would have seen there had only been 2,179 of them cast, or so the record says on that day. On the morning of Wednesday the 8th however, that number jumped to 19,696. On the 9th, it rose again to 27,832. The morning of Friday the 10th, it showed an increase to 33,470 and it would peak at 35,777 by the 14th. Apparently it takes a full week just to get some of these ballots entered into the system and that is simply unacceptable. Before it was over dozens and dozens of these records would simply disappear from the file with no explanation just before the counties voted to accept them or not. One curiosity that defies an obvious explanation is why hundreds and hundreds of Provisional Ballot voters who had provided their phone number on their Provisional Ballot Application in case any follow-up was needed had that number removed from the record just prior to the County voting whether to accept it or not. Some were approved and most were not but there is no apparent rhyme or reason behind it. 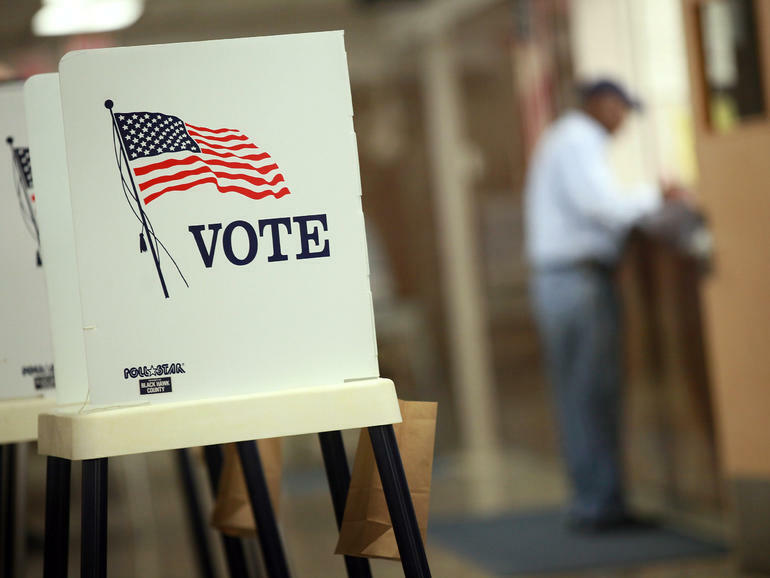 Other voters saw their precinct of registration, precinct where they voted or the precinct where it was counted change before, during or after the County’s vote. Hundreds who voted in the right precinct had their ballot only partially approved while others who voted in a different precinct saw theirs totally approved. This is a clever way of allowing votes for one candidate and denying them to another. Yet others saw their precinct of registration go blank in that data field a week after the county made their last upload to the State. If the county didn’t change it, who did and why? And is it legal? I have spoken personally with several Directors of Elections at the county level to inquire and confirm with them if any of this is a matter of policy and appears to them to be consistent with regular election operations, and they all claim it is not. They are as baffled as we are. At times, I have found it necessary to look back at past election results to see for myself if data was handled in similar fashion or not. That is when I discovered that archived data files for them have been modified much more recently. As Figure 1 shows, there were a number of them changed in May of 2017 beginning late in the afternoon of May 10 and continuing the following day from morning til night. Because of the very brief period between the modification of one file and the next, it strongly suggests that the changes were not manually made, but rather made by a program written and executed to change them in some fashion. The three file types involved just happen to be the Absentee, Provisional and Voter History files that record who voted in that fashion. Again, it is unlikely a coincidence that these same ballot types are the types under investigation in more recent elections. If there was something to hide, it is now gone. I also discovered that many of those who cast a Provisional Ballot last November because there was “No Record of Registration” wound up with sequential voter registration numbers. This suggests those voters’ records weren’t found but rather they were added to the rolls one after the other despite the requirement to be properly registered before the election. Yet their dates of registration are anything but sequential. Some dates of registration go back for years. As Figure 2 shows, several counties I chose had quite the disparity between 2016 and 2018 in the number of these sequentials that appear in their records. But what makes it even more disconcerting is that the record reflects, for example, that one of them registered to vote in their county back in 1990, is shown as an “Active” voter, has voted in every election since then up through 2016 and still had to cast a Provisional Ballot because there was “No Record of Registration”. What is even more suspect is that their date of registration shows up as March of last year, and now with a whole new registration number! As I said in Part 1, it smacks of electronically digging up the dead. It is all very confusing. It is overwhelming at times for all of us. Our Legislators are no different and it will take them time to wrap their heads around the sheer magnitude of it all but they are actively listening and engaging in the necessary discussions to put a stop to all of this data manipulation. I am promised that we will see significant legislation put forth this session to address these many concerns. For now, the analysis and digging continues. There is a larger truth yet to be found.